problem of juvenile delinquency, decided to start a Boys & Girls Club and incorporated as the Boys & Girls Club of Paradise Ridge. 1998 – After group of community members, Partners for Youth in Paradise purchased, renovated and donated a building in downtown Paradise to the Boys & Girls Club of Paradise, the club opened on the Skyway in September. 1999 – The Boys & Girls Club of Chico purchased, with the help of the S.H. Cowell Foundation, the Sierra Health Foundation and the City of Chico a warehouse located directly across the street from its club site with the plans to build and renovate its site into a downtown Campus For Kids. 2000 – The Boys & Girls Club of Chico and the Boys & Girls Club of Paradise Ridge merged to form the Boys & Girls Clubs of the North Valley. 2001 – The Boys & Girls Clubs of the North Valley officially launched a capital campaign and successfully raised over $3million to build a downtown campus. 2003 – The Boys & Girls Club of Chico completed the first phase of its campus and opened the doors of the Ostrander Clubhouse in October. Street permanently and completed the design and development of the Rotary Plaza which joined the Clubhouse and Nettleton Gymnasium / Teen Center. 2006 – The Boys & Girls Club of Chico completed the final phase of its campus and opened the doors of its teen center and Nettleton Gymnasium, completing the downtown campus. 2007 – The Boys & Girls Club of Paradise Ridge expanded from one site to open clubs on three elementary school campuses, two in Paradise and one in Magalia. The Skyway site was renovated to become a Boys & Girls Club Teen Center. 2007 – The Boys & Girls Clubs of the North Valley opened a club within the walls of the Butte County Juvenile Hall located in Oroville. 2014 – The Boys & Girls Clubs in Juvenile Hall became the first of its kind to be awarded 21st Century Assets 5-year grant funds. 2016 – The Hamilton Elementary Boys & Girls Club opens on August 16, 2016. 2017 – Became a Platinum GuideStar participant – commitment to philanthropic transparency. 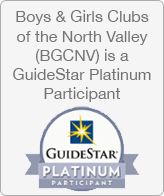 2018 – Awarded 2018 Platinum GuideStar participant. CEO, Rashell Brobst received the Woman of the Year for Assembly District 3. After 10 years at the Southside Community Center the Oroville Teen Center moved to the high school campus of Las Plumas.